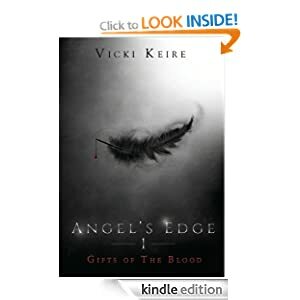 Gifts of the Blood (Angel’s Edge 1) Vicki Keire. I’m not usually a reader of YA novels but sometimes I see one which appeals and that’s how I came to request this. It’s unusual in the way Vicki portrays the angels, and it takes some though to get my head around the way she describes their wings and the way they move, but its good, something different and that’s hard to come up with in today’s market with millions of books out. So, Caspia? Well, what can I say about her? Coffee addict that’s for sure, and I could see that she was a loving sister, bogged down by responsibilities and looking after her dying brother. Their parents and family are dead, and all they have is each other. That’s heartbreaking and I could feel her pain from it. The drawings she does of the future were interesting, and I could see where her parents were, frankly, freaked by it and preferred to ignore it, but that’s a huge burden too for her now that her gran, the only person she could talk to about it, was gone. She had a best friend but she couldn’t confide in her about her drawings for fear she’s react like her parents. Caspia seemed lonely at times, and I felt for her but…at times she was just odd. Odd in her reactions to events, people, places and I couldn’t understand her motives for what she did. That made it more difficult to feel close to her and to worry about her. I need to feel empathy with the main characters to really enjoy a book, and maybe id I was a YA I’d have been better able to understand her. Then there’s Logan, poor lad, knows he’s dying and feels he’s a burden to Caspia while still worrying about her after he’s dead…what a terrible thing to have to carry, and yet most of the while he was cheerful and upbeat. Also in the novel there are others who live in the town, who seem perfectly normal, and yet as the tale continues we see they’re holding secrets. Of course I couldn’t help but like the delicious Ethan, who’s something of an enigma even when we learn what he is, and the mad at times, sane at others Asheroth who both play major parts in the book. Again I found these two somewhat confusing in their actions and motives, but they were a fresh and fun take on the angelic genre. As the story unfolds and we learn more about Caspia and her drawings, the mysterious Ethan and the others similar to him, and the people around Caspia who are more than they seem the action gets hotter, secrets come out but rather than giving answers they open up more questions. Poor Caspia is confused – her life in danger, and she needs to find out more about the mysteries that surround her. I enjoyed this novel, first of a trilogy, but felt a little detached from the characters and their actions much of the time. The story was well written and flowed easily, its just that I didn’t always understand the reactions the characters had. Maybe that’s because I’m too far from the YA audience and looking at it with a different perspective? I’m sure for teens and early twenties this series will be a must have, but for me, well, an enjoyable one off read, but I’m not invested in reading further into the series. Its priced at £2.99 for 222 pages.